When the weather warms up it is always good to have foods that are going to fill us up, be good for us and are simple, easy and fuss free dishes to create. This salad is just that, it ticks all those boxes and the great flavours are an added bonus. I cannot remember how I came about this combination, but I have been making this salad for some years and it is great as an accompanying dish as well as on it’s own for a light lunch. A few basic ingredients put together to create a dish that even children enjoy, as my son loves having this salad. I do not add salt to this salad as the feta cheese is very salty, however if you are not using feta cheese then you may want to add a little salt. 1) Remove any large stalks of the spinach. Ensure that the spinach is dry and then place in a large bowl. To this add the remaining ingredients, mix well together and you are ready to serve. Kiran ~ It is a great dish packed full of iron because of the raw spinach. I have never had spinach in my salad, looks interesting! 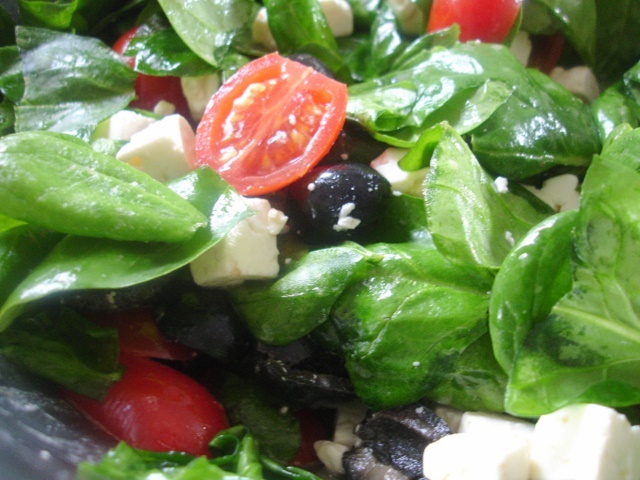 I love Greek salad too…infact my favourite salad. Baby spinach in this salad seems to be an interesting version.